The JEP is seeking applications for its next class of participants who will begin the program in May of 2019. See below for details on the program and application process. At the Justice Entrepreneurs Project, we prepare talented and entrepreneurial lawyers in the Chicago area to build innovative, socially conscious, and sustainable law practices serving low and moderate-income clients. We believe in the power of entrepreneurial lawyers to make a difference as solo practitioners in the quest to ensure access to justice for all. Are you a newer lawyer interested in obtaining the skills and resources necessary to build an innovative and successful law practice? Are you interested in making a positive impact on your community as a social entrepreneur? We offer access to mentorship, continuing legal education, a network of like-minded individuals, and subsidized resources to kick start a legal practice targeted at the underserved middle market of potential clients. Have graduated from law school in the last ten years (the program is intended for lawyers eager to innovate and advance the profession, not those entrenched in traditional practice models; exceptions to the graduation year guideline are made on a case by case basis). Participants in the JEP develop their practices while receiving training, mentoring and other support on business and legal issues as well as space and other infrastructure as they get started. The 18-month program is broken into three 6-month modules. In the first module, participants perform pro bono work approximately 20 hours per week with partner legal aid organizations. Throughout that time, participants receive training, workshops and coaching on business and other issues needed to start a solo/small practice. Participants establish their own independent practices (including providing their own malpractice insurance), begin handling cases in areas traditionally needed by low and moderate-income clients, and strive to offer predictable and fixed, modular fee models for their services. During the second and third modules, participants develop fuller caseloads and continue to receive training, mentoring and coaching on business and legal issues, preparing to move their practices out of the JEP at the end of the 18 months. Participants pay a participation fee of $300 per month during the last 12 months of the program. Questions? See the Frequently Asked Questions for potential participants. Fill out an application here. Please submit a resume, a copy of your law school transcript and a statement of interest of no more than 3 pages: (1) describing your vision for your practice (including practice areas and target markets) and your participation in the JEP and (2) describing a circumstance when you have demonstrated entrepreneurial initiative or another experience that demonstrates your ability to be a successful social entrepreneur. Information sessions to learn more about the program will be held at the JEP offices at 208 S. Jefferson, Suite 204, on Thursday, February 28 at 12:00 pm and Monday, March 4 at 5:30 pm. Sign up here. Please apply no later than Monday, March 11, 2019, to be considered for the next JEP cohort. Two rounds of interviews will be held in late March and early April. Selections will be made by April 15th for the May 6th, 2019, start. 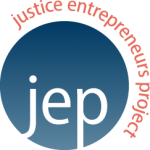 The Justice Entrepreneurs Project is an incubator designed to help lawyers develop the skills necessary to create and operate a successful law practice that provides affordable legal services to low and moderate-income people and small businesses. Participation in the JEP creates an immediate positive impact on the community through participants’ bono work and provision of affordable legal services. The JEP ultimately hopes to create long-term community impact by incubating law practices that will operate over the long-term. If your ultimate goal is job placement rather than creating your own law practice, please do not pursue participation in the JEP. For more information, contact Trevor Clarke, Director of the JEP, at (312) 546-9939 or tclarke@chicagobar.org.